As I was driving home from work yesterday I got a craving. Smack. Straight out of left field. I wanted a bloomin’ onion. You know, the classic Outback Steakhouse appetizer extraordinaire. All 1,560 calories, 84 grams of fat, and 5,510 milligrams of sodium extraordinaire. Or…not. One brief trip to the grocery store later, I was able to create a bloomin’ onion that surely wouldn’t result in immanent cardiac arrest. Cut onion ends without separating onion layers, making sure one end flat enough to keep the onion standing on its side. Cut onion into a floret-style, carefully separating the onion layers. Combine the cornstarch, paprika, seasoning salt, cayenne, and pepper. Spray the onion lightly with cooking spray and sprinkle with cornstarch mixture. Drizzle egg whites over onion. Sprinkle with bread crumbs. Bake for 45 minutes. Combine the remaining ingredients: sour cream, ketchup, seasoning salt, cayenne, horseradish, and paprika. Serve onion warm with the horseradish dipping sauce. Result: Yum!! My only advice: DON’T eat half of it…at least not without Tums. Or if you’re eating with someone you’d like to kiss sometime in the near distant future… 😉 Oops. Your comments from yesterday – wow! You guys are fat-savvy! I was really impressed with the opinions you all have regarding fat in the diet and the importance fat plays in satiety and balance. Question: Have you had a Bloomin’ Onion? Did you like it? What other menu items have nutrition stats that cause you to cringe? « Saturated fat…bad? Or better? Oooh, this looks like a delicious re-creation! Ugh– why do regular blooming onions have to be SO bad for you?!? I’m really impressed with your re-creation of the blooming onion! I’ve had one, but it had to have been 10 years ago or so. They are yummy, but way to greasy. Oh man, I love the bloomin onion! Something about fried veggies. Your creation sounds amazing! Nice healthy alternative. 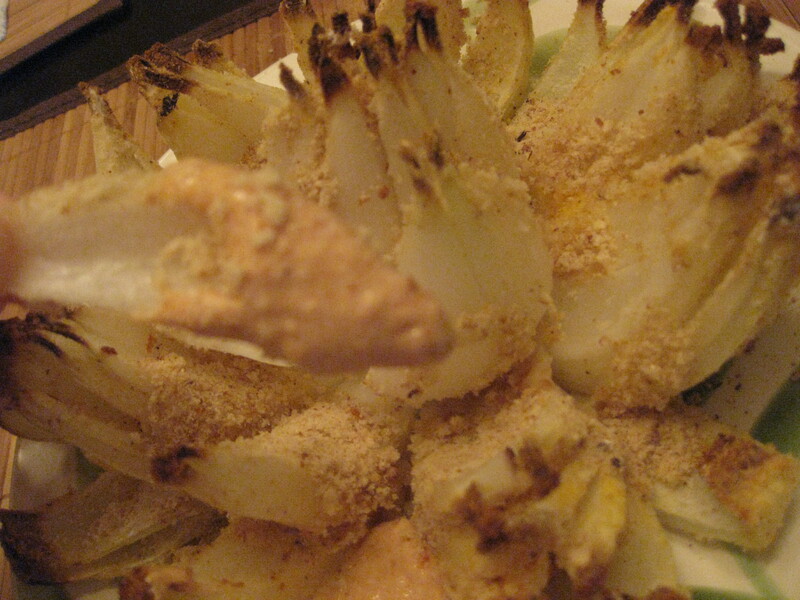 I love blooming onions especially the horseradish sauce with it, thanks for posting your recipe. My friend and I get one to share at the Bloomsburg Fair every year, it comes with two sauces, this one and a ranch. I other heart-attack food we also love, deep fried Oreos. Only had them once, but Yum! I’m really impressed with your creativity in making a blooming onion at home. I don’t think I would ever do it though because a bloomin onion, to me, is like a once in a decade treat to share with 5 other people. I’ll stick with the heart-attack-on-a-plate version. that sauce is what kills me every time. I could eat it by the spoonful! For some odd reason I don’t like bloomin onions, but I love sports bar/pub onion rings! I’ve never tried a blooming onion due to the fact that they are always SO greasy at restaurants! I guess I never thought to make my own, brilliant creation, can’t wait to try it! I hate onions with a passion. But Outback’s cheese fries? That’s like a week’s worth of calories right there. That restaurant’s nutrition info is scary. I love onions and that looks like a winner recreation! My husband hates onions so that just means more for me! yay! WOW! best re creation EVER! that looks great girl! This looks so good though I’ve never heard of a blooming onion before ;). My goodness! I love Bloomin’ Onions from Outback!! I used to work there and it would be so hard not to want one everyday! And the delicious dipping sauce ! Oh boy. Your recipe looks awesome! Thanks for such a fun and new spin on an old favorite! Thank you so much for this recipe!! I’ve actually never had a blooming onion because everyone tells me how terrible they are for you. I’ve always wanted to try one, but never order them because no one will share one with me…and I’m certainly not going to eat the whole thing! I will be definitely trying this version! The aroma of the bloomin’ onion is much more satisfying to me than the actual taste, and it is pretty, too. Nicole- This looks fantastic. I think I can make it gluten free as well! Bloomin’ onions are deadly but now we can eat them guilt free. Nice recreation. I have never made one at home, but I have tried this. The other items that are insane in stats would be anything at cheesecake factory or claim jumper, where they are known for generous portions that you are never meant to consume in one (even 3) sittings, and the choc cake from PF Changs, which despite all the cals, I love to share with people. Have a great weekend. nom nom nom/….I love sweet onioons! I saw a remake of this on hungrygirl too! your version looks FANTASTIC!! yummmers! 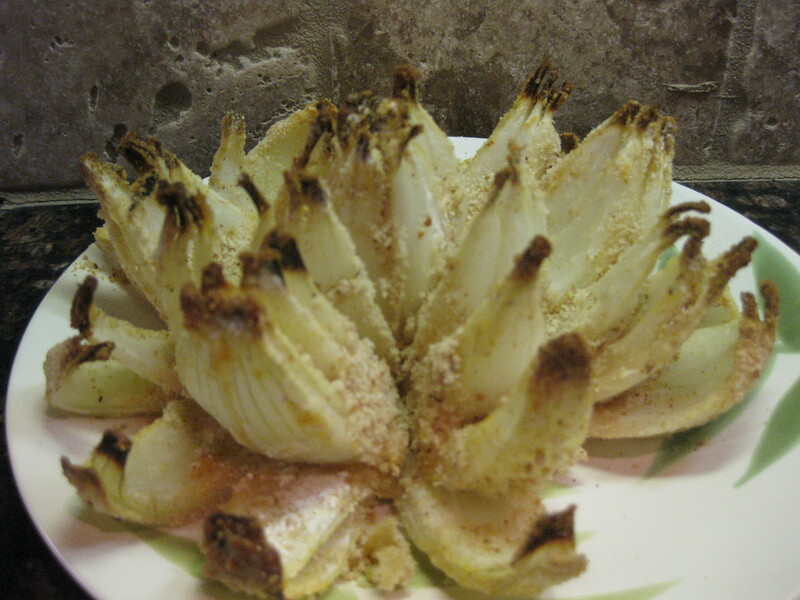 I’ve never had a blooming onion – how fabulous! LOVE those blooming onions! 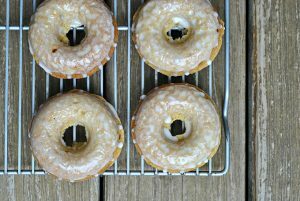 Will have to try out that recipe on my family and let you know what they think:) Thanks! That’s amazing! I would love that! I just tried to comment on your most recent post and I couldn’t load it from the email version that was sent to me…. Oh well…I love your kitchen! We are beginning the house hunting process very soon and a nice kitchen is on the tp of my must-have list! I boo-booed! That’s my post for tomorrow! I hit “publish” instead of “schedule” — it’ll be up early tomorrow morning. Sorry about that! House-hunting is so much fun! The kitchen was key for me, too!! Take lots of pictures, that’s all I can say…after seeing 20 houses a day, they all blend together! This bloomin’ onion is freakin’ amazing! How did you come up with this ‘healthified’ recipe? It’s great! I can’t believe the stats on Outback’s version. That makes me sick. I know many would disagree, but I wouldn’t mind seeing nutritional stats on menus. Some people wouldn’t care, but I totally would consider it before ordering. The Cheesecake Factory has some real scary items on the menu. I just saw some of their stats today online and it freaked me out! EEK! OMG I HAVE TO PRINT THIS AND MAKE IT ASAP!!!! I LOOOOOOVE THE Blooming Onion!!!! 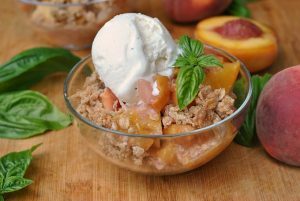 Great remake of a really, really unhealthy recipe! I’ve avoided the onion, but could probably be tempted with yours! What a great recipe! I also love Outback’s cheese fries with ranch, luckily though, I can’t even remember the last time I had them (4-5 years ago maybe?). Enjoy your weekend! I always wanted to try a bloomin’ but never have. Much different from onion rings? I’ve had lots of them. I love that you had a craving and you satisfied it in such a great way!! Yippee for you, I bet you felt so much better taking this recipe into your own hands 🙂 It looks fab. I’ve certainly had a Bloomin’ Onion before at Outback!! It really wasn’t that great, but was rather impressive. I’d rather not know the nutrition stat though, lol. Impressive onion. Which brand of applesauce do you use? I’ve never had the real version of this, and I don’t ever want to…but I’m excited to try yours! How creative! I wouldn’t have thought to make this on my own. Awesome twist on the bloomin’ onion! Heck yeah!! Great idea to make your own bloomin’ onion. I can’t BELIEVE the stats on the real one. I mean, gross! I realize this is probably an appetizer that gets shared with several people, HOWEVER, I am sure there have been plenty of individuals who had downed the entire thing all by themselves. Scary, but true. Personally I would rather get that many calories from ice cream, or pizza, or lasagna! Not a fried onion…. I would much rather eat yours!! Very creative. I love how you lightened it up! It looks addicting!